Champagne Smile cosmetic dentists combine their extensive experience with sophisticated dental technologies to give patients an unsurpassed dental experience. Their state-of-the-art office features some of the finest dental equipment available. During consultations, Champagne Smile dentists administer the Dexis Digital X-ray system, which uses less radiation than traditional X-ray systems. Dexis Digital X-rays also reduce the amount of time processing the results, allowing our dentists to treat patients quicker and more efficiently. The use of specialized operating microscopes means that the doctor is able to get a detailed look at the work they are doing during all phases of your treatment. The additional magnification and illumination allow them to work with great precision and see small details such as calcified canals and fractures. The dentist is able to more accurately diagnose and treat the patient using a dental surgical microscope to improve the potential outcome of the treatment from “good” to “excellent”. Further, some microscopes may be equipped with high resolution video and digital photography allowing the doctor to enhance patient communication and document treatment. The Dexcam intraoral camera allows Champagne Smile dentists to gain a deeper understanding of patients’ teeth, and obtain a detailed analysis of the mouth. With the use of the Dexcam, Champagne Smile dentists can treat patients with higher levels of precision and safety. Before the dentists begin their treatment, they evaluate each tooth with the DIAGNOdent laser-cavity detection system. This system allows them to identify the earliest forms of tooth decay before they become larger problems that require more extensive treatment. Champagne Smile dentists use the Florida Probe to detect signs of gum disease in patients. Florida Probe is a sophisticated technology that helps to diagnose periodontal disease and chart the success of gum disease treatment. According to the Oral Cancer Foundation, close to 37,000 Americans will be diagnosed with oral cancer this year. Oral cancer will cause over 8,000 deaths, killing roughly 1 person per hour, 24 hours per day. Because the signs and symptoms of oral cancer are often missed by the naked eye, Champagne Smiles has acquired the technology to detect oral cancer earlier. 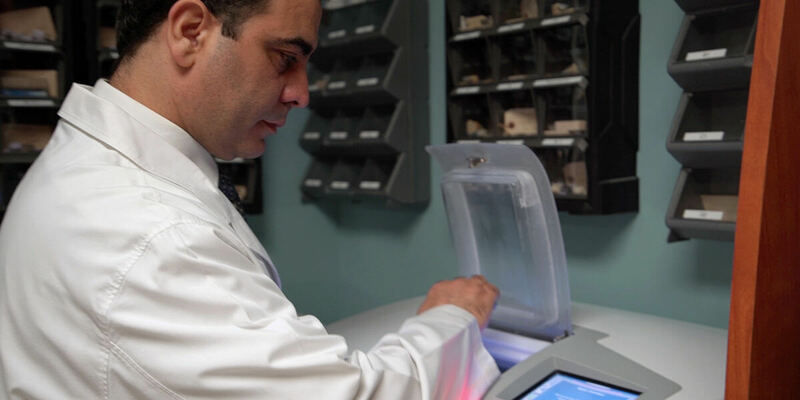 Our state-of-the-art Identafi® system allows us to more effectively identify biochemical and morphological changes in cells of the mouth, throat, tongue and tonsils. The device is about the size of a power tooth brush, and uses three different wavelengths of light to help detect any suspicious areas in the mouth that would be impossible for us to see with our naked eyes. These suspicious areas, upon further evaluation, are usually benign.